An exciting Hero I-League contest between Shillong Lajong FC and Mohun Bagan ended 1-1 at the JN Stadium here on Wednesday. Jeje Lalpeklhua put the visitors ahead in the 75th minute, but Lajong bounced right back to get the equaliser after Aser Dipanda Dicka converted a penalty in the 77th. This was the 10th goal for Dicka, who is leading the charge for the Golden Boot. The Reds started the much stronger team in this 15th round contest, moving the ball around the pitch with consummate ease. Deft touches and a fine understanding between the players saw Lajong bag the majority of the possession in the first half an hour. 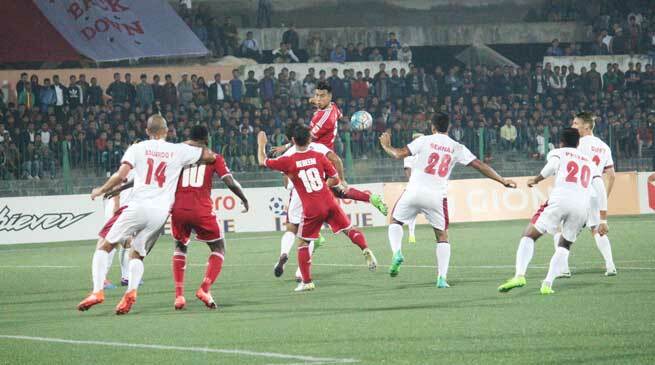 Lajong could have taken the lead in the 17th minute, except for some fine goalkeeping skills displayed by Bagan’s Debjit Majumdar, who deflected a ballistic strike from Redeem Tlang onto the post and out for a corner. The hosts did not let that disappointment get them down with Dicka keeping up the pressure with a fine low attempt on goal that Majumdar had to block again soon after. Bipin Singh was also impressive and dangerous on the left flank, twice forcing the Kolkatans into desperate defensive moves in the first session. The visitors then began to find their feet and the Reds had to be on their toes to guard against the likes of Mohun Bagan’s Sony Norde, Katsumi Yusa and Darryl Duffy, who were threatening at various times over the course of the match. Vishal Kaith was up to the task under the bar, saving two good chances in the last 10 minutes of the half. Although a goal would get past him later on, that was more down to a defensive lapse and the U-22 custodian was duly named Hero of the Match for his overall excellent performance. The first half thus ended goalless, but there was no let-up in intensity in the second 45 minutes, with the home team thrilling thousands of Lajong Faithfuls with some fine attacking play in the opening few minutes. In the 48th minute Bipin audaciously went between the legs of a defender, but Bagan were lucky in that Majumdar was alert and managed to gather the ball. A couple of minutes later and Vishal had to make another save, this time off a Sehnaj Singh volley from the edge of the box. Later on two long-range attempts from the visitors went way over the bar and Bagan coach Sanjoy Sen pulled Balwant Singh out in place of Jeje, a move that almost immediately bore fruit. Just six minutes after he came on, Jeje was the recipient of a long ball and he had no one marking him. Vishal advanced to try and cut off the angles, but the experienced Indian international chipped the ball over the goalie and into the net. The Mariners were understandably elated with the lead, but that proved to be short-lived as Fabio Pena, who was brought on to replace Samuel Lalmuanpuia, saw an attempt of his on target from inside the box handled by an opposition player, resulting in a penalty. It was no surprise that Dicka took the spot kick and he handled the pressure brilliantly, firing the ball past the keeper in the 78th minute. That was not the end of the action as both sides looked extremely likely to get a winner, but it was a day of heroic saves on the part of the two goalkeepers. Lajong stay in fourth place on 24 points, while Bagan move up into first position with 30 points. There is little time for the Reds to recoup, as they have tough opposition to face on Saturday, 15th April, when they host Bengaluru FC at the JN Stadium, Shillong, at 2PM.